A few weeks ago, leading up to the BCS National Championship Game, since the Ohio State Buckeyes were playing, it got me thinking about Buckeyes…. the candy, that is. Peanut butter is always at the forefront of my mind, and I’m always looking for new ways to incorporate it into a life that is already pretty saturated by the nutty stuff, but eating it 3x a day from a spoon isn’t enough. Nope, gotta cram it in in every way possible! So while I’m not suggesting that I rooted for Ohio State to win the game (Sorry! It goes against my core football beliefs! ), I was nevertheless inspired to revisit classic Buckeyes to see if I could spin a new twist on them! So that was Part 1 of the evolution of this idea for Buckeye Graham Crackers. When I’m not eating peanut butter straight from a spoon, I will sometimes spread it on a graham cracker. Do other people do this? I love it as a quick snack. Peanut butter and graham crackers are such a great pair. 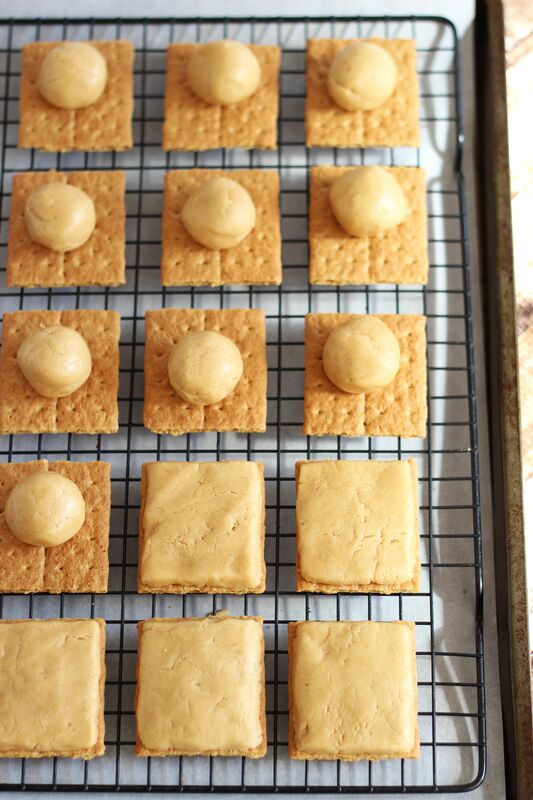 Graham crackers have a honey-like essence to them that I think is a perfect complement to PB! I also love the contrast of creamy peanut butter with a crunchy graham cracker. With that in mind, I decided that I wanted to combine Buckeyes and graham crackers. And here we are: Buckeye Graham Crackers. I loved the idea of taking my basic snack of PB on a graham cracker, but making it unhealthy. No, wait. I didn’t mean to say that. I meant… making it an indulgent candy! Yes, that. Sounds much better. Pretend I didn’t say unhealthy. Forget that even came up. I also really like that they’re flat so they can be eaten like a cookie. The format is just… fun. I fought the urge to take this idea a step further by stuffing a melted marshmallow in-between two of these. Is that going too far? If you really want to get bonkers, you could definitely do that. Live on the edge. It’ll be worth it. 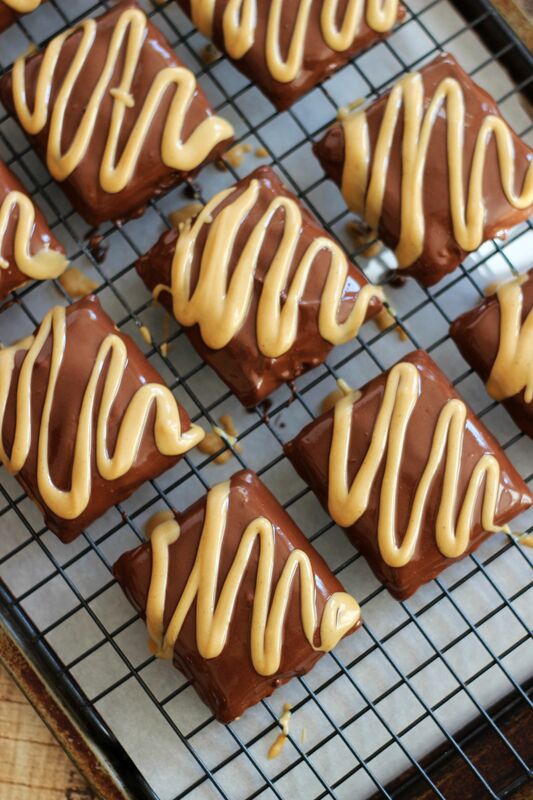 If you love other peanut stuff, you know I have no shortage of PB recipes. Some of my most popular are these White Chocolate Peanut Butter Truffle Bars, this Peanut Butter Cup Brownie Torte, and my Gma’s No-Bake Peanut Butter Pie Recipe, of course. 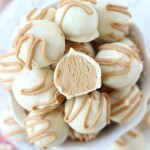 These White Chocolate Buckeyes are also SO popular!!! So there you go! You did a fantastic job with these! Such a creative idea and beautiful! Buckeyes are one of my favorite cookies! I love your creative twist on these graham crackers, Sarah! Peanut butter and chocolate is the best combo ever! These were *delicious*. They were such a great treat. Thanks, Gayle! My family eats graham crackers and peanut butter sandwiches every day. I never even considered that we mit be the only ones… Well, if so, we’re proud to be just as weird as you;) I wasn’t born in Ohio, but have lived here for so many years, that I can make and appreciate a good Buckeye! I love what you’ve done with the traditional candy recipe and am sure that the crunch of the cracker really goes well with the smooth texture of a Buckeye:) Pinning these for our church’s Super Bowl party this weekend. I know they’ll go crazy over them! Thanks for the recipe, friend! Thanks, Heather! I loooove PB on graham crackers. I didn’t know if anyone else did that? A friend in college turned me onto it! It’s such an easy and delicious snack. I just thought it would be fun to turn it into a candy, and they were delish! Let me know if you try them! They were a little time-consuming, but altogether easy! Just be careful not to break the graham crackers. I only broke 1, but I could see it happening if not careful! 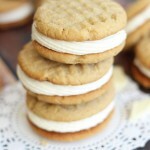 I’ve never had a buckeye, but peanut butter on graham crackers is definitely one of the best snacks EVER!! Love these Sarah! Buckeyes are just the ultimate in PB + Chocolate, and I thought it would be fun to smoosh one onto a graham cracker base. I love PB on graham crackers! Thanks, girl! I have never had a Buckeyes but these pictures are tempeting me so much! Especially that peanut butter drizzle! Yum! Oh wow! You must try them! 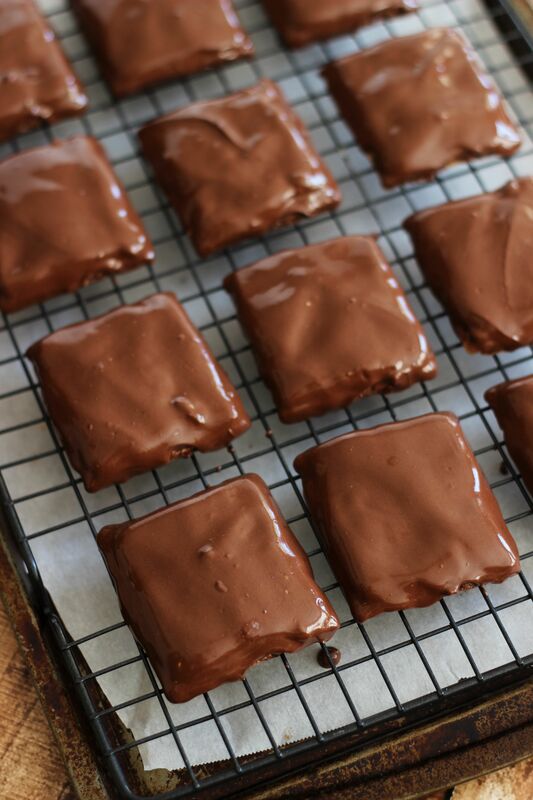 They’re basically like Reese’s cups, but homemade (of course!) and round like a ball. They’re fabulous! 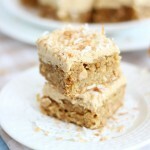 I love graham crackers with peanut butter, so I thought these would be a fun spin! Lol. Right? These are addictive!!! 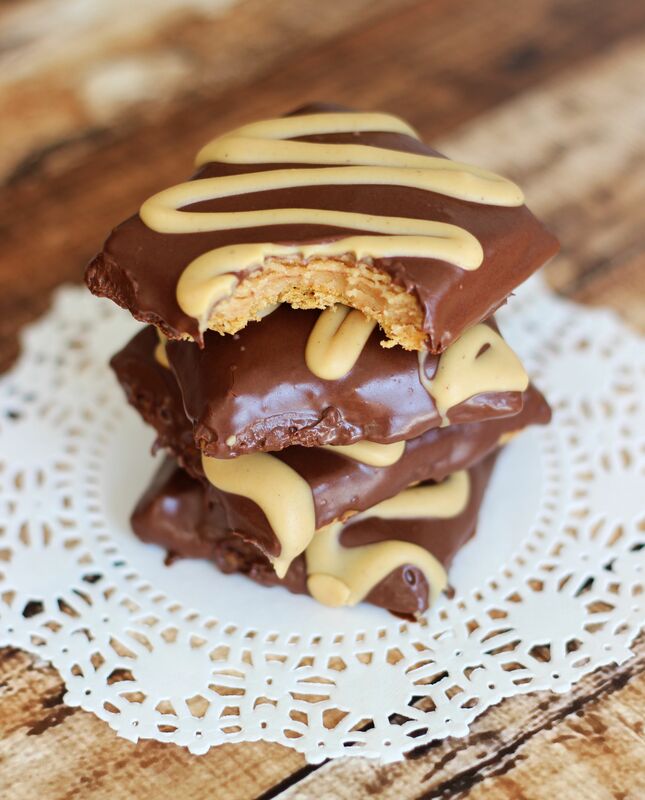 PB + Chocolate + Graham = best snack ever!! These are brilliant! Of course, I would have to make them for someone else because if they stuck around my house for very long I’d eat every last one. For sure. We ate them all, went through them quickly, and didn’t share. They’re definitely a decadent treat! Graham crackers are good, and you just made them even better!! I love great, easy ideas like this! Perfect for afterschool on busy days. Me too!! Such a great combo. And the graham crackers add a nice crunch and honey essence. YUM! This just makes me so happy. I heart buckeyes! What a great idea! So creative! I love buckeyes but these sound even better! They look amazing, Sarah! 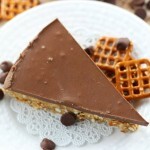 I was looking for a healthy recipe for a dessert and this looks absolutely amazing to me! Omomomomom!! I’m in love with your goodie! Yay! So glad you like the recipe. I can’t promise how healthy they are, but there are definitely worse things! They’re delicious! Okay want to make these but cannot see if you topped them with another cracker or one layer? I only did 1 layer, but you can certainly do that. The exact way I made them is explained in the recipe directions and you can see in the photos pretty well too. I hope you like them! Thanks! Tapping into those Ohio roots, eh?!?! Just wanted to say I am now a senior citizen and when I was in grade school I always took graham cracker with peanut butter and marshmallow cream for lunch all the kids would want to trade me out of it, its wonderful. I think these look great!! Will def try! I recently discovered PB on vanilla wafers are amazing!! The second batch I make will likely have them in for a twist. Thanks for the ideas! Ooooh. The men in my family will love this – thanks for sharing! 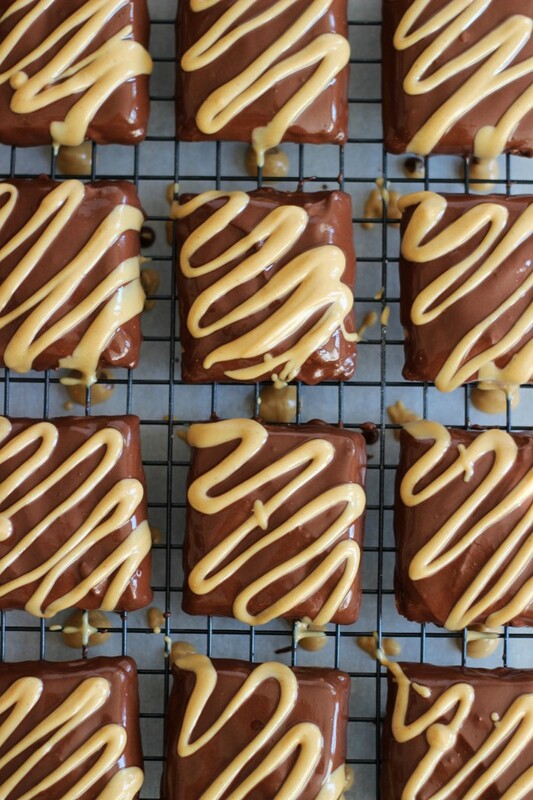 Yes, they’re a sure win for all PB and chocolate lovers! Thanks so much, Maritza! Oh my gosh! These look amazing. I love buckeyes and I love graham crackers! Oh Yes! These look perfect! 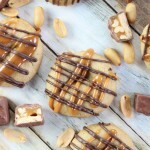 Peanut butter and chocolate is my all time favorite dessert combo! This will be going on my Pinterest boards and will be made in my kitchen soon! Thanks for sharing! Yay! So glad you like them! I am a bit for PB and chocolate together too. Such a classic convo! Thanks, Brittany! We made these for the Super Bowl with friends and they were amazing. They didn’t look nearly as nice as yours, mostly due to some mistakes during the dipping process (we didn’t press the peanut butter down hard enough), but they tasted unbelieavable. 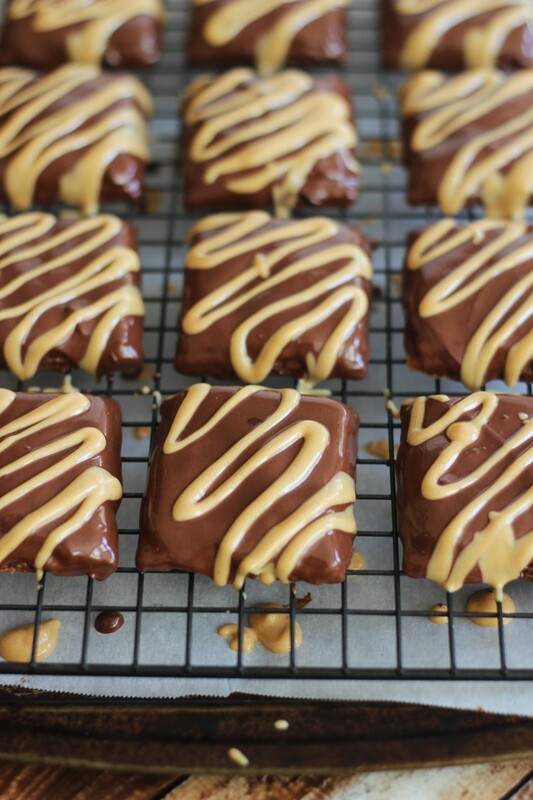 Just for fun, instead of putting more peanut butter on top, we used butterscotch chips for the final drizzle. I would definitely recommend it! Everyone loved them. I think it’s less about the PB getting pressed down, and more about keeping the chocolate thin and warm, and doing a pretty quick dunk. If it dunks too long, the peanut butter gets warm! Thinner chocolate helped – just add a little more shortening or coconut oil to it to thin it out! A teaspoon at a time until it’s smooth and thin. The butterscotch drizzle is a GREAT idea!!! I love that. These are delicious! I just made 80 of them! One hitch: I let them dry too close to one another and a bunch ended up fused together. Still presentable though, and I love that they won’t dry out or go stale in a couple days like most Christmas cookies. Thanks for the creative recipe! This is brilliant! We love buckeyes and I can totally imagine this recreation is drool worthy. Can you make these ahead of time and freeze them? I do something similar with peanut butter and Ritz crackers. They freeze well. Hi Marilyn! I have not tried that, but I would think you could do that, and they would turn out just fine! I hope you enjoy them! Hi Shannon! 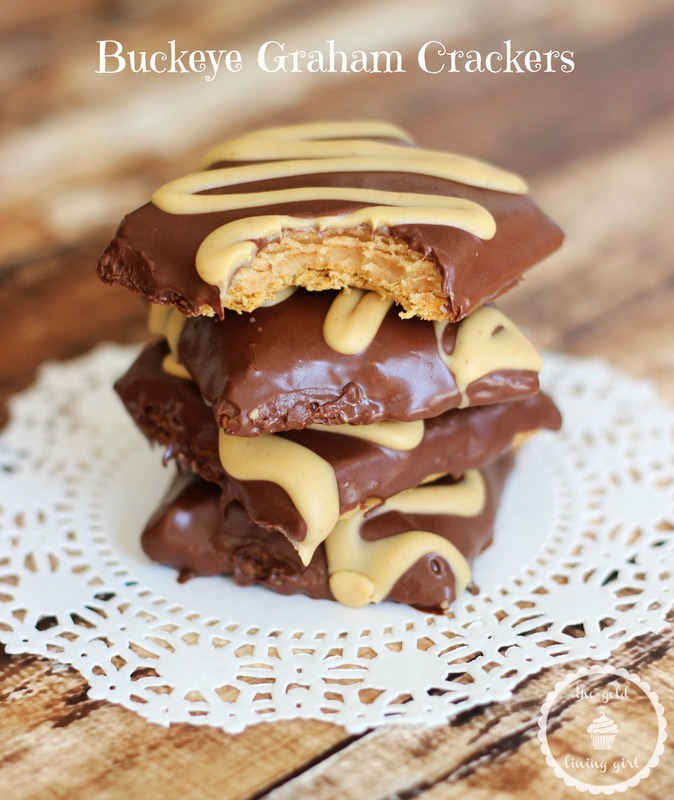 Well, I guess I think of Buckeyes as peanut butter filling and chocolate coating, so these felt like Buckeye Graham Crackers to me, but I get a lot of questions about ALL my Buckeyes recipes! People keep saying they are not authentic because of things like that. Haha! I guess that’s true! I’m from Ohio originally, but I really grew up more in Pennsylvania, so I guess I’m bad at making Buckeyes authentic. Lol. I went to Penn State… Go Nittany Lions!!! 🙂 My SIL and step-mother are HUGE Ohio State fans!!! Happy New Year!